As shown in the figure below, two metal balls are suspended and a negatively charged rod is brought close to them. If the two balls are in contact with each other what will be the charges on each ball? Explain how the balls get these charges. What will happen to the charge on the second ball (i.e., the ball further away from the rod) if it is momentarily grounded while the rod is still there? If (instead of grounding) the second ball is moved away and then the rod is removed from the first ball, will the two balls have induced charges? If yes, what will be the charges? If no, why not? Figure 18.61 A charged rod and two hanging metal balls. The left ball will be positive, and the right ball will be negative. Electron's in the rod repel electrons in the left ball. The right ball will become neutral. Yes. 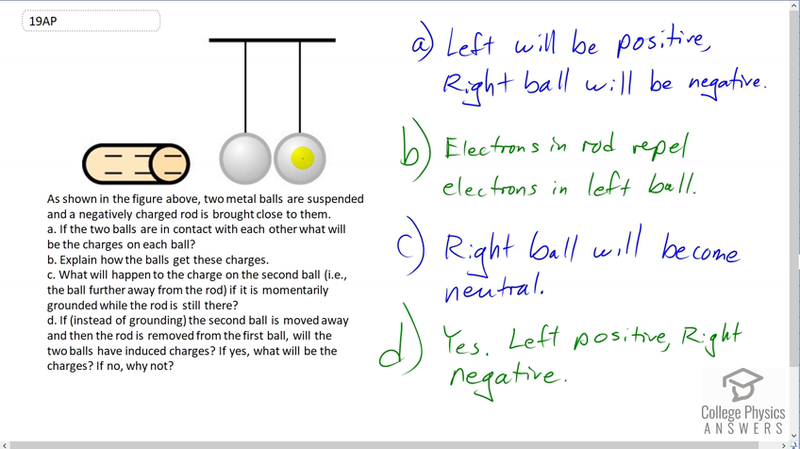 The left ball will be positively charged, whereas the right ball will be negatively charged. This is College Physics Answers with Shaun Dychko. A negatively charged rod is brought close to these two suspended metal balls but does not touch them. The metal balls are touching each other though. So what's going to happen is that the electrons in the ball on the left will be repelled from the electrons in this rod and they're going to go over to the right hand ball. Then the left hand ball will become positively charged because it has lost some of its electrons that have gone over here to the right hand ball. So left will be positive and right ball will be negative. In part B, the explanation is that, yeah, electrons are repelled in the left hand ball. So this is called induced polarization. What will happen to the charge on the second ball, that's this right hand one, if it is grounded while the rod is still there? Okay. So it has a wire connected to ground and ground will provide a path for all these electrons to leave and they will go to ground. That will neutralize this right hand ball. Then part D says if instead of grounding, so forget about this grounding, the second ball is moved away and so this contact is taken away and there is space now between them. Will they be charged? The answer is yes because this right hand ball is negative and the left hand ball is positive. There we go!